Protecting the Rwandan sector of the Virunga Mountains, the 160km2 Volcanoes National Park is best-known as the place where Dian Fossey launched her pioneering study of mountain gorillas in the wild in 1966, and where the Oscar-nominated film Gorillas in the Mist was shot on location in 1988. It is one of Africa’s most scenic national parks, comprising a chain of six extinct and three active volcanoes whose steep forest-swathed slopes are linked by fertile saddles formed by solidified lava flows. 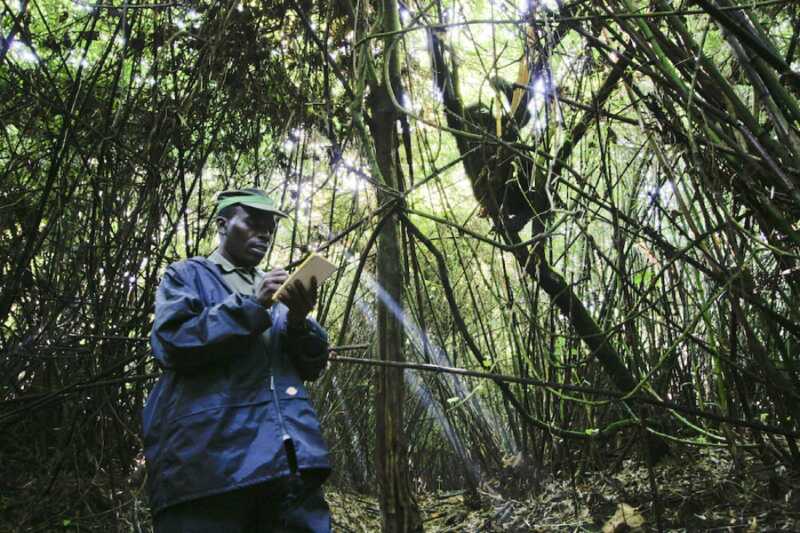 Straddling the border with Uganda and the DR Congo, the Virungas provide sanctuary to more than half the world’s mountain gorillas, and the Rwanda component is home to a dozen habituated groups for which a total of 96 tracking permits are issued daily. Other wildlife includes the nimble bamboo-guzzling golden monkey, elusive populations of elephant and buffalo whose spoor often litters the forest trails, and the likes giant forest hog, bushpig, bushbuck, and black-fronted duiker. Around 200 bird species are thought to inhabit the mountains, a list that includes at least 16 Albertine Rift Endemics. Tracking mountain gorillas is far and away the most popular tourist activity, but it is possible to extend a stay with other activities such as golden monkey tracking, hiking to Dian Fossey’s former camp at Karisoke, and hiking to four of the volcanic peaks. Tracking mountain gorillas in the Virungas ranks high on almost every traveller’s bucket list of must-do experiences. And the reality seldom disappoints. Gorillas are more closely related to humans than any animal other than chimpanzees, and the sheer bulk of these charismatic apes - a silverback might weigh 200kg - is deeply impressive. Meanwhile, the very fact that tourists can routinely approach gorillas to within a few metres pays testament to their remarkable peaceable temperament. True, the hike up can be hard work. You’ll be climbing steep slopes, through tangled vegetation, at an altitude of above 2,500m - and it isn’t called rainforest for nothing. But the reward, a magical hour spent in the company of nature’s archetypal gentle giants, is quite simply one of the world’s most exhilarating and emotionally charged wildlife encounters. An Albertine Rift Endemic whose range is practically confined to the Virunga Mountains, the handsome golden monkey is named for the luxuriant orange-gold patches on its back and flanks. Daily tracking excursions run into the national park to visit a habituated troop of these delightful hyperactive monkeys, which generally frequent patches of bamboo - their primary diet - but also sometimes gather at fruiting trees. 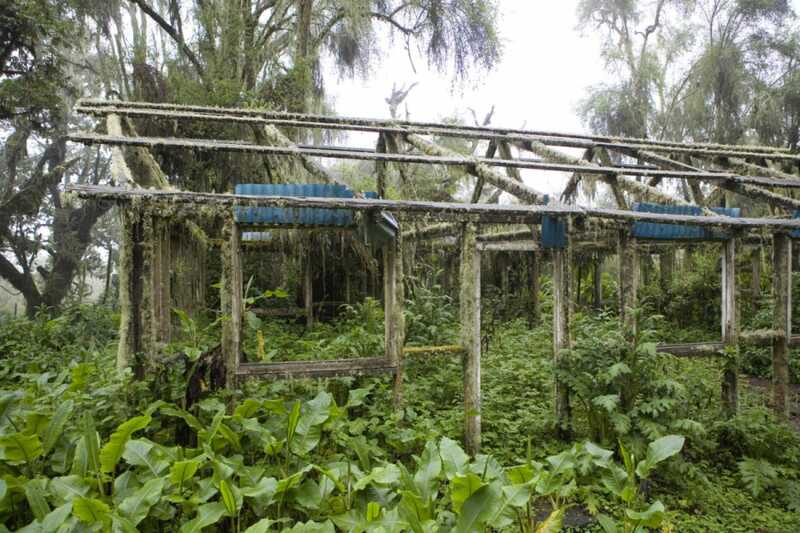 A popular half-day round hike leads to the original Karisoke Research Camp, which was founded by the legendary primatologist Dian Fossey in 1967. Set an altitude of around 3,000m on a forested saddle connecting Mount Karisimbi and Mount Bisoke, the camp had to be evacuated several times during the civil war, and it was eventually relocated to the town of Musanze at the mountains’ base. Nevertheless, it is profoundly poignant to visit the living quarters - now in ruins - where Fossey was murdered in 1985, and to pay tribute at her tomb, which stands alongside those of several gorillas killed by poachers during her tenure. 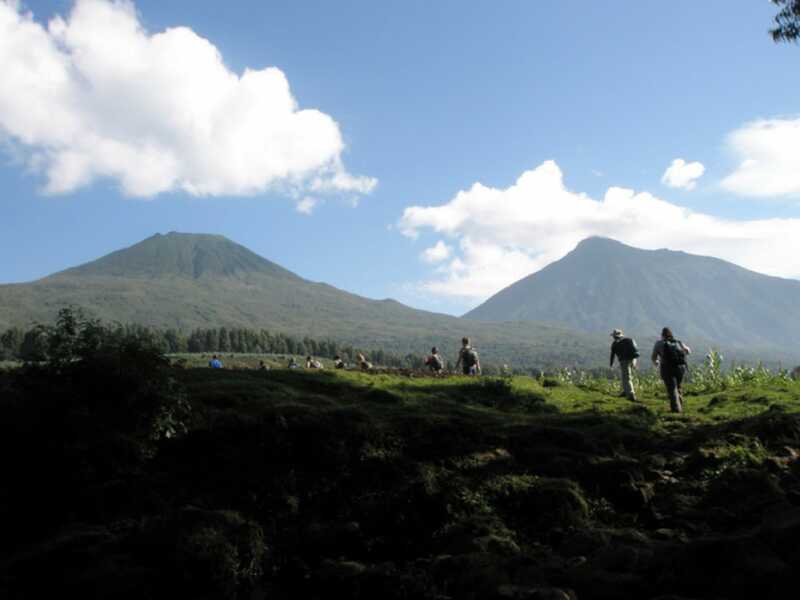 Guided hikes can be undertaken to four of the Virunga Peaks set within the parks. Most worthwhile is the day hike up the 3,711m Mount Bisoke, which is topped by a beautiful crater lake enclosed by slopes swathed in atmospheric giant lobelias and hagenia woodland. It’s a steep hike, gaining more than 1,000m from the trailhead to summit, and the descent can be treacherous after rain. For dedicated hikers and summit baggers, the most alluring of the Virunga peaks is Mount Karisimbi, which stands at 4,507m, making it the tallest point in Rwanda and sixth-highest mountain in Africa. Karisimbi also boasts the greatest vegetation diversity of the Virungas, and the ascent rises through clumped bamboo and hagenia forest to the otherworldly Afro-alpine zone. It’s a steep hike even by the standards of the Virungas, and it entails camping overnight in near-freezing conditions. Bordering the national park, Gorilla Guardians (better known by its former name of Iby’Iwacu Cultural Village) is the flagship for a community project that project that provides employment as niche farmers, beekeepers and the like to about 1,000 local villagers. It also offers tourists a fascinating and enjoyable programme that culminates in a traditional Intore drumming and dance routine set in a fantastic wood-and-thatch replica of a traditional Rwandan palace. 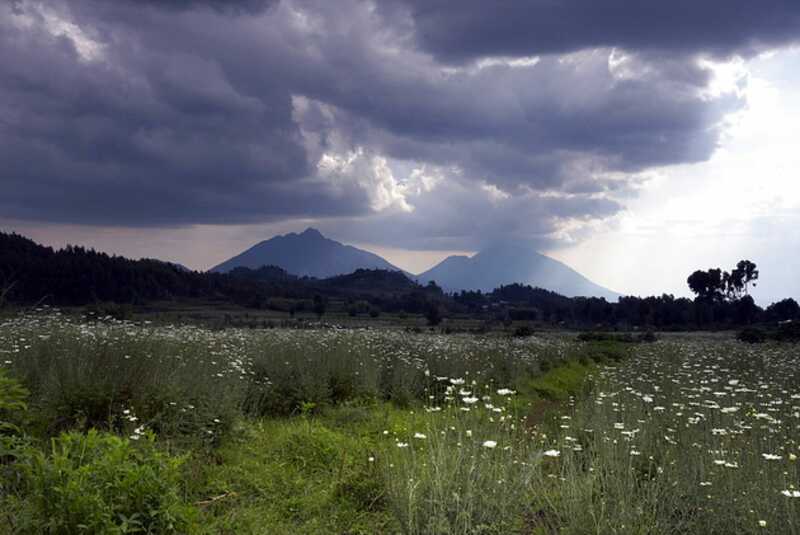 All activities in Volcanoes National Park start at the park headquarters in the village of Kinigi, which lie 12km north of the substantial town of Musanze, and 110km from the capital Kigali. Gorilla tracking and other hiking permits are best bought in advance and participants must be at the park headquarters by 7am, or they risk invalidating the permit. There is no accommodation within the national park, but several lodges and hotels can be found along its borders, at Kinigi, and in Musanze. The nearest international airport is in Kigali, so you need to travel by road from there. It is easy to get as far Musanze or Kinigi on public transport, but if you do this, you will need to charter a 4x4 with driver to get you to the trailhead in the morning. Technically it is possible to track gorillas as a day trip from Kigali, but it isn’t recommended as you would need to leave at around 4am to be sure of getting to the park headquarters in time.